Only the creativity of the user can determine the boundaries of UNIMAT 1-Basic. 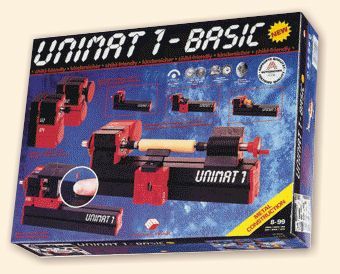 The UNIMAT 1-Basic kit was developed specifically for model-making with wood. The user will be delighted as their creativity allows them to form turned work pieces and jigsaw models, entirely by hand. With UNIMAT 1-Basic "anyone can build a miniature size scale of the entire world." Dollhouses with perfectly-scaled furniture, historic ship models with turned railings, or gear wheels and a new axle for the radio-controlled car. The machines have the same features as big industrial machines, the only differences are their size and the 12V drive. Included in the kit are the components for a jigsaw, diverse variations of woodturning machines, a handheld sander, a stationary sander, and a handheld drilling machine. All the machines of the UNIMAT 1-Basic kit are child-friendly. Due to the short strokes of the jigsaw blade, the fingers of a young carpenter cannot be injured. At the same time, professionals are delighted by the accurate and precise cutting of the saw. The powerful jigsaw can be used with plywood, solid wood, balsa wood, plastics and thin sheets of soft metal. It has a cutting capacity of up to 20mm balsa, 7mm solid wood. No annoying opening and clamping of the jigsaw blade when cutting windows and holes. Main uses: fret work in plywood, precise sawing of tarsia in veneer wood, adjusting of printed boards, and many simple household repairs. Special use: The only child-friendly jigsaw in the world. The short strokes allow for precise cutting, but can only vibrate the skin, thus not allowing the skin to be cut by the blade! Ideal for both your intricate work and your child's projects. The smallest lathe in the world creates elaborate pieces of turned wood. With a distance between centers of 135mm (expandable to 324mm) and a maximum centre height of 25mm (extendable to 50mm with option), the efficient 12V power machine works smoothly. Now the hobbyist has a lathe for those small work pieces, and youngsters from 6 years of age and up can participate in the first steps of woodworking without any danger. Main use: scale masts, railing parts and gun barrels of historic ship models, a wide variety of turned furniture and dishes for the dollhouse, and miniature spinning wheels. The work piece is clamped only on the one side using the faceplate. You can now hollow out the wood using the turning gouge. The classic example for faceplate turning is an eggcup. Tiny sticks of wood or soft metal up to a diameter of 6mm can be secured in the countershaft using the collets. The true running of the two ball bearings allow for highly precise, miniature workings that can not be matched even by some high priced, specialty machines. The stationary rotating sanding disc provides the final touch to your work pieces. In addition, you can now keep all of your tools and other everyday objects well sharpened. From your scissors to carving knives, the annoyance of dull blades is finally done away with. With a simple removal of a few handles from the machine bed, you now have a practical handheld sander. This variation works very well for those hard to reach places. Finally, the spots of rust on that good old 1973 Volkswagen Beetle can be removed. Just replace the sanding disc with a drill (0.5 to 6mm), fix it with a collet, and you have the perfect tool to reach those hidden places that need drilling. In addition to the standard machines included in the kit, this UNIMAT 1-Basic modular system offers an unlimited variety of potential tool machines due to the wide range of available accessories. Longer machine beds (up to 1m) and slides for those who feel they would like to handle larger scale projects are available. A detailed description of the wide range of accessories is also included in the kits. determine the boundaries of UNIMAT 1-Basic.